Update: this item was pushed to the Metro Board’s June agenda. The Board of Directors approved the contract at their June meeting. 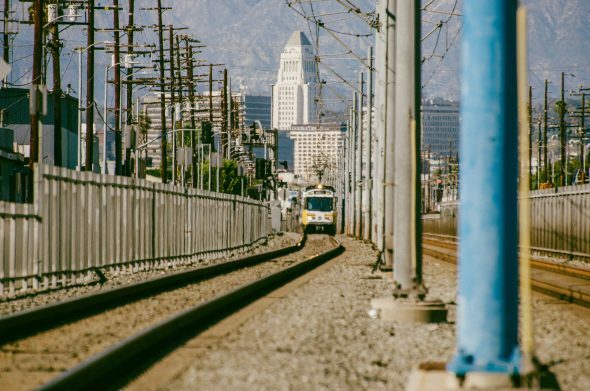 One of the more important items going to the Metro Board this month: a proposed $81-million contract for Blue Line track, electronics and signaling upgrades with Mass Electric Construction Co./Parsons. The Metro staff report to the Board is above (pdf here). Among the work would be the addition of four locations where Blue Line trains could switch tracks (called ‘interlockings’ in transit speak). That makes it much easier for more trains to get around locations where maintenance work is taking place and other service issues (a train with mechanical problems, for example). Bottom line: less delays getting where you’re going. This is one of several projects that has been taking place to upgrade the Blue Line, which is Metro’s second-longest (22 miles) and oldest (it opened in July 1990) light rail line — and also its busiest, with about 70,000 average weekday boardings at last count (ridership stats here). Metro is also in the process of replacing old rail cars on the Blue Line with new ones. Go Metro to U2’s Joshua Tree shows at the Rose Bowl! Always good to see Metro making investments in existing infrastructure and expanding the public transportation systems that it oversees. All that work during the past year on the Blue Line and now they are proposing more. Reeks of the two 405 projects where new construction on the first project was demolished for the second project one year later. Maybe at one time it was the longest, but the Gold Line is longer than that now. You sir are absolutely 100 percent correct! Thanks for heads up and I’ll fix that now. Where would the new interlockings be located? The Board Report doesn’t say. Asking another way: are the new interlockings a secret? Or will they be determined after the Board vote?